The story of Tamar is a tragic one. The beautiful daughter of King David caught the eye of her half-brother, Amnon, who lusted for her. At the advice of his cousin, Amnon feigned illness and manipulated Tamar into his bedroom. Once alone, he grabbed and solicited her. Three times Tamar refused. When her pleading wasn’t enough to stop him, she talked about the implications: her disgrace and him appearing as foolish and wicked. In desperation, she even suggested they ask dad for his permission to marry. But Amnon refused to listen to her. He raped her. Then his supposed love for Tamar immediately turned to an even more intense hate. When he told her to leave, Tamar refused, saying that him kicking her out would be an even greater insult. Amnon had her forcibly removed from his presence. Tamar then went to live with Absalom, her full-brother, in desolation. The story of Tamar is in 2 Samuel 13:1-21. 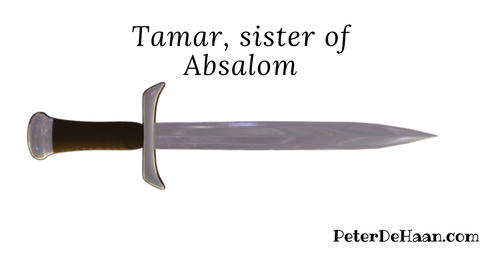 Read about another woman named Tamar.